Olympic 100m champion Justin Gatlin has had his eight-year suspension for doping in 2006 reduced to four. The United States Anti-Doping Agency (Usada) confirmed an arbitration panel had voted 2-1 to a four-year ban. The 25-year-old was originally given an eight-year ban instead of a lifetime sanction after agreeing to help Usada's anti-doping campaign but appealed. 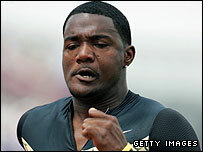 Gatlin, who also failed a test in 2001, will not be able to race until 24 May 2010, but may decide to appeal again. The American, who had expected to be able to defend his Olympic crown in Beijing, has accepted testing positive, but claims he never knowingly used banned substances. Gatlin, the 2005 world 100m and 200m champion, and his solicitor have not yet commented on the verdict or whether the athlete will appeal against the decision to the Court of Arbritration for Sport (Cas). However, Gatlin's mother says her son is still hoping to compete again. "There is no doubt about that," she said. "We will be talking to his lawyer. I think everybody is blindsided by this decision." Gatlin gave a positive test for testosterone at the low-level Kansas Relays in April 2006. It was his second failed drugs test and, under the World Anti-Doping Agency (Wada) code, he should have been given a lifetime suspension. But Usada, in exchange for Gatlin agreeing to cooperate with its anti-doping campaign and in recognition of the exceptional circumstances of his first failure, imposed an eight-year ban, although the athlete decided to appeal against the length of the suspension. Usada chief executive officer Travis Tygart said on Tuesday: "Mr Gatlin should be commended for his decision to cooperate with authorities following his positive test. "However, these efforts do not completely remove his responsibility for his second doping offence. "Given his cooperation and the circumstances relating to Mr Gatlin's first offence, the four-year penalty issued by the arbitration panel is a fair and just outcome." He failed his first test in 2001 when amphetamines were found in his samples at the USA Junior Championships. But it was accepted that medicine he had been taking for 10 years to control attention-deficit disorder was the reason for the failed test. Gatlin started his appeal against the eight-year ban last summer and has now been given the minimum sanction recommended by world governing body the IAAF back in 2006. The Washington Post reported that two out of the three arbitration panel members said they could not give less than a four-year ban because of the previous positive test. Gatlin has not competed since winning the 100m at the US national championships in June 2006.